Notice:The following colors are intensely bright shades. I, Imperfectly Painted am not responsible to any damage done to your eyes by these amazingly fluorescent shades. To help reduce ease the brightness of these colors I suggest the following....wearing sunglasses, doing the macarena, or sprinkling yourself with magical pixie dust found in the mythical forest. However, I do not recommend using any protection against these shades because they are amazing! Ok, just kidding. You're not going to get eye damage from these viewing colors. That was my dorky failed attempt at being silly. Today, I'm going to show you some of the brightest colors in my collection. I like neons, but they aren't colors I'll wear often. When I want to wear a neon, I want it to be a great true neon. I think these fit the part! 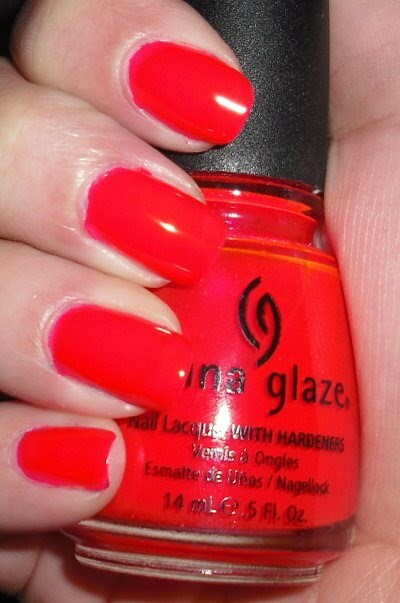 Rose Among Thorns is from the China Glaze INK Collection. This is the same collection with Flying Dragon & Blue Sparrow. This is a reddish-pink neon jelly. I have a funny story about this one. I was up one night before a meeting and last minute I wanted to change my nails. I didn't have a lot of lighting in my room, so I picked up this shade and in lower lighting it looked tame. I painted my nails and woke up the next morning in shock! My nails glowing! Suffice it to say, I had to paint over the color quickly with a muted creme to tame it down before a meeting. I wouldn't suggest this as a work appropriate color! This color is great though for any other occasion. 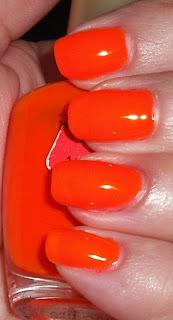 It's fun bright color that literally glows on your nails. I really like these shades and I have some more neons to show you later on, but I think these are some of the brightest I have along with some of new China Glaze Poolsides. Like many neons, these do dry matte so if you like it shiny put shiny top coat over it, if not leave it be or put matte top coat on it. Even though I'm sure the world doesn't view these as the most practical colors, I think they are fun colors to have and wear. Poo, on what the world thinks :P.
I'm glad I could cheer up your day a bit! Wow! I needed shades for those swatches! Wow, these are beautiful and look great on you!! I don't wear brights too often, but good ones are always nice to find.